Pretty pink, orange and white flowers of the shrub Lantana camara or wild sage, are common in ornamental gardens across many parts of the world. Although considered beautiful and hardy by landscape designers, the species is reviled by conservation biologists as “one of the worst weeds in recorded history”. The aggressive growth of Lantana camara in habitats outside its native territory (originally the American tropics) has led to its spread over 20 million hectares. 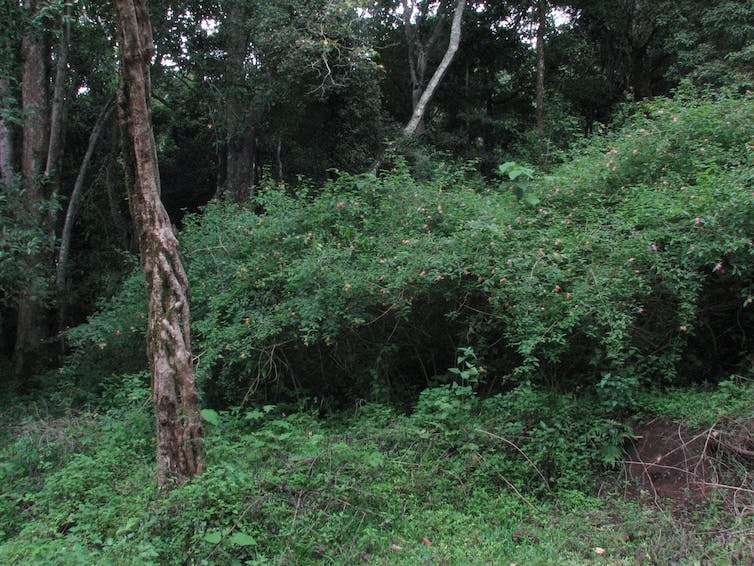 In the Biligiri Ranganathaswamy Hills Tiger Reserve in Southern peninsular India, we have studied the spread of the shrub in dense thorny thickets across the park, where it has choked out other plant species, and obstructed the movement of wildlife, creating a major challenge for park managers. Lantana camara is not unique in its effects. Other invasive alien species, such as the well-known salt-cedar which originates in Eurasia, have transformed large landscapes by their rapid spread within a few years. 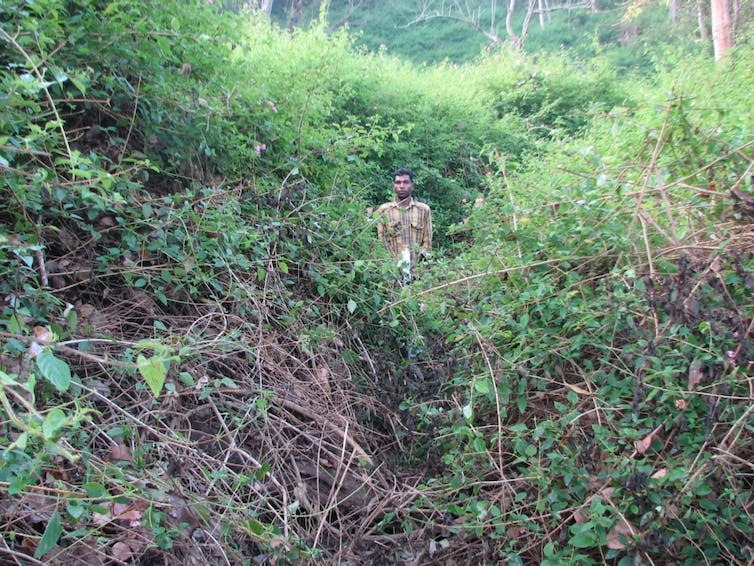 Conservation planners, such as the managers of the Biligiri Ranganathaswamy reserve, find it a challenge to contain the aggressive expansion of such invasive alien plants, which impact local biodiversity and ecosystem services. Most aggressive shrub invaders such as Lantana camara partially or completely replace the native shrub species in forests. While Lantana was brought in as an ornamental plant and has now spread extensively due to berry-feeding birds, other similar invasive species such as Chromolaena odorata (sunflower family) are wind-dispersed. It is important to find solutions that can provide high quality, frequently updated maps of the distribution of invasive plants, so that they can be effectively located, targeted and removed. Given the large areas over which they spread, managers are increasingly turning to high-tech methods such as remote sensing. This involves photographing landscapes using special cameras in space (on satellites) or in air (on aircraft), that detect more than what the human eye can see, for example because of their capacity to record information in the infra-red and thermal visible spectrum of light, and then deriving information from these pictures. In recent years, very high resolution satellite data has become available. These can detect objects less than a meter in size, and have greater ability to distinguish the identity of plants due to images taken in narrow, highly specific wavelengths of the electromagnetic spectrum..
We reviewed recent research in this direction, finding that while the advances in technology help, they need to be combined with ecological knowledge of invasive plant behaviour, for more effective mapping. Plant functional traits serve as an effective way to capture many important aspects of invasive species that can be used for mapping via satellites. Plant traits are characteristics of plant structure and function that impact how they spread, survive and respond to environmental and other conditions. Among the numerous traits that plants have, some are well suited to mapping using satellite data. These can be broadly categorised into three types – seasonal (phenological), structural and physiological. Invasive shrub Lantana camara occupying niches in the understorey tropical forest. 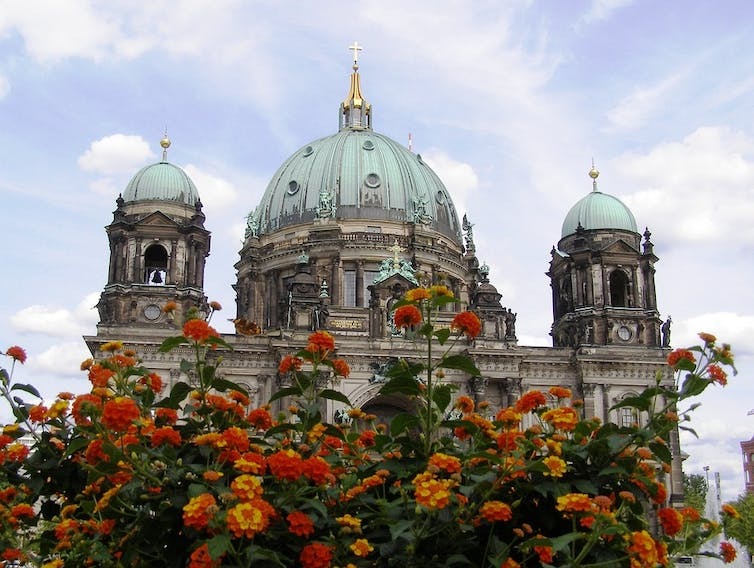 Plants produce leaves, seeds and flowers at specific times of the year, which can be tracked by remote sensing. Differences between invasive species and native species in the onset of senescence (coloured leaves, and leaf fall), leafing (green leaves), or flowering (presence of coloured flowers), show up clearly within specific spectral wavelengths used by satellite sensors at selected times of the year. This is an especially effective strategy to map shrubs and herbs, which are located below the canopy and hence obscured from the satellite sensors. For instance, the invasive Amur honeysuckle – Lonicera mackii was mapped in the late fall/autumn season, when the deciduous trees were leafless, and the invasive climber was clearly visible through gaps in the leafless branches of the overstorey trees. 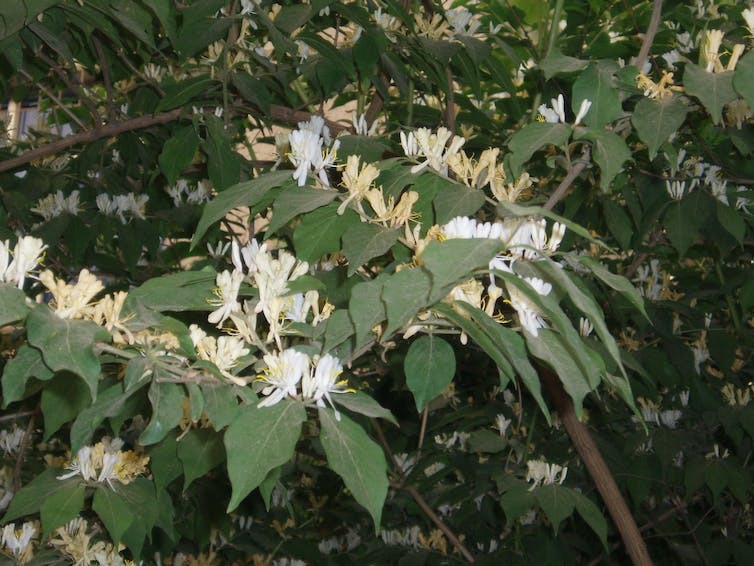 Amur honeysuckle – the understorey climber. Structural traits – such as clumping into clusters distributed among native plants, or height – can also be used effectively for mapping. In our own research in the Biligiri Ranganathaswamy reserve, we were able to map Lantana camara’s large contiguous clumps spreading patterns. LIDAR data which use pulsed laser light rays to provide 3 dimensional maps of the earth’s surface, is also handy, for instance to monitor the distribution of five invasive trees species in Hawaiian forests. The Lantana species invade almost everything and anything. Here in the Biligirirangana Hills, Karnataka. Invasive alien plants are often able to spread faster because of physiological traits such as faster growth due to higher resource utilisation. For instance, studies have shown that leaf Nitrogen concentration and moisture content of invasive plants is different from native species. LIDAR, RADAR (sensors that use radio waves) and imaging spectroscopy can help discriminate invasive species by assessing differences in their photosynthetic efficiency (use of light energy). Our review of the use of plant traits for invasive species mapping via remote sensing shows that phenological and structural traits have been exploited for mapping, but physiological traits have potential to be better utilised. This monitoring of invasive plants constitutes one of the 20 targets – set under the Convention on Biological Diversity in 2010 at Aichi in Japan – that aim at protecting biodiversity. Since then, remote sensing has been increasingly proposed as a tool to achieve this goal and is currently entering its golden age with drone mapping. Combining ecological insights with advanced remote sensing technology could better enable society to meet its commitment towards biodiversity protection.